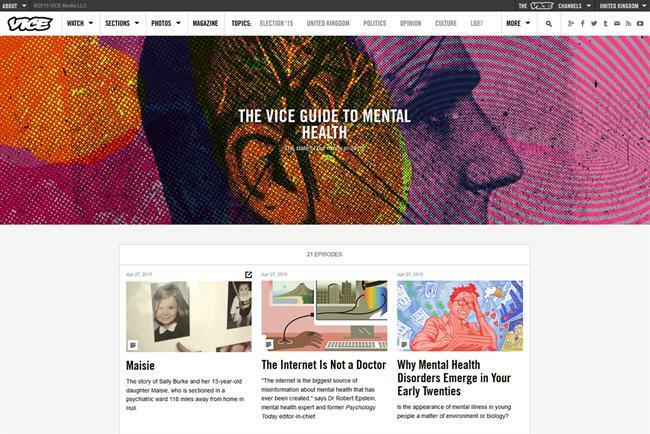 Vice has partnered with the charity Mind to launch The Vice Guide to Mental Health. The editorial project addresses some of the issues around the mental health of young people in the UK today, ahead of the General Election on 7 May. One in four people in the UK will experience a mental health problem each year and yet conversations in the public sphere remain diminutive. The Vice Guide to Mental Health aims to remove the stigma around talking about mental health and deliver a human-focused campaign that shows the reality of living with a range of mental health problems. In a style Vice is now known for, the media owner has commissioned and produced a wide range of original, first person articles and a documentaries designed to widen conversations around mental health. The project has been translated into six languages across 15 territories, with local editorial pieces commissioned in all of those territories. Editorial content includes an investigation into mental health within black, ethnic minority and LGBT communities, uncovering underreported illnesses such emetophobia, analysing the semantics of mental health and an exploration of Mind’s latest Infoline statistics, which show the impact of austerity cuts on vulnerable people battling mental health conditions. Additionally, Vice has produced an original documentary, following the 118-mile journey a Hull mother must make to see her daughter who’s been admitted to a specialist mental health unit in Sheffield. Paul Farmer, chief executive of Mind, said: "Young people are at the heart of The Vice Guide to Mental Health and the powerful film, first person accounts and interviews are empowering people with mental health problems to share their stories and help others feel less alone. "For the most part, the way society thinks about mental health is changing for the better – and much of that is thanks to campaigns like this, which will continue to shift the thinking, and behaviour, of people in the UK. "We've seen that Vice's work exposes the need for frank, exploratory dialogue when it comes to mental health and we’re looking forward to working with them long term, to help to tell the real story of mental health." The content will be hosted on a dedicated The Vice Guide to Mental Health hub on vice.com. Vice and Mind promote the material across both organisations’ social networks, using #VICEMIND, to take the content and issues to new audiences. Eleanor Morgan, senior editor at Vice Media, said: "Each year, one in every four Britons will experience mental health problems. To put that in context, the same percentage of Brits ‘drink to get drunk’, snore and steal those little bars of soap from hotel rooms. "For Vice, mental health feels like the most urgent topic of discussion in the run up to this year’s election. This is because the coalition government seem to have spent the last five years designing a country with which to provoke a mental health epidemic, while simultaneously hacking away at the safety net that is there to deal with such a crisis. "So, with the election just 15 days away, and with none of the main parties pledging enough support for the ailing NHS, we decided to highlight just how important mental health provision is. "Like all of Vice’s election coverage, we have sought to look beyond the pantomime and hone in on the issues at hand. Who is eventually elected matters far less than the work that there is to be done after 7 May; they will all have the same problems to solve. "We hope that 'The Vice Guide to Mental Health' makes plain just how big a problem mental healthcare is in Britain today."